This is the extremely rare 'blond' Hawkeye figure that has been featured twice on Personal FX: The Collectibles Show. 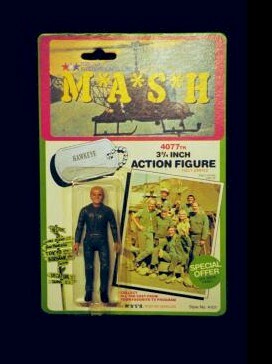 Hawkeye (Alan Alda) had dark hair on the show and most of the figures on the market were correct. For some reason though, somebody at the toy factory was sleep at the switch one day and these blond haired figures slipped through. This was one of the most popular TV shows of all time, but I liked the earlier episodes better than the last few years of the show. In my opinion, the show became too maudlin(remember Sammy Maudlin?) and Hawkeye got real creepy towards the end. Many later episodes were directed by Alan Alda, who tried to make the show into a Korean "ER", and took away much of the show's madcap humor. Website design and hosting by Sohodojo Business Services. Item 235 of 466 items displayed in viewer. 0 items in cart.